Successfully Added Android Phone "Acrux" - 4 Inch HD Display, Dual SIM, WiFi to your Shopping Cart. If you can only have one, then buy The Acrux. A super Android 2.2 Smartphone with 4 inch HD Touchscreen, Dual SIM, and WiFi, the Acrux is your ultimate choice for a smartphone. The Acrux uses a vibrant and bright 4 inch touchscreen that responds immediately to any touch. This allows you to easily slide your finger across the smooth screen to navigate through web pages, photos, eBooks, and more with the ultimate ease. Spread your wings with the Acrux and enjoy all there is to offer from its media capabilities, applications, two way high quality camera, Dual SIM convenience, Bluetooth, Wi-Fi and avenue to the most popular marketplace today. The Acrux comes with everything you need to organize and manage your busy personal and work lifestyle. You have easy access to your Notes, Calendar, Email, Social Networking and other vital sections of your task flow. Keep connected with all your friends and family with the integrated applications like Facebook, MSN, and Gmail. Get on demand entertainment from Mobile TV, YouTube, Music and Radio. Further moren, with the almighty Android Marketplace, you will get access to thousands upon thousands of fun and useful apps, games, most of which are totally free! In a nutshell, The Acrux has everything you’ll need, and best of all, it’s available for an amazing bargain! While Chinavasion continues to grow as the #1 Chinese electronics wholesaler, so does our relationships with China’s top factories. That’s why we're confident that you will not find an Android 2.2 smartphone of this caliber for such a low wholesale price- anywhere. Just search Google to see for yourself. If you don’t own an Android smartphone by now then you really owe it to yourself to experience what the amazing Acrux smartphone has to offer, at this price you really can't go wrong. Order now though because at this price supplies are expected to go fast! Dual SIM: Use two SIM cards at once! WiFi internet support: Fast and free internet speed! Comes with Facebook, Youtube, Twitter, Gmail, eBuddy, Wiki Mobile and much more! Access to tons of FREE apps and games with the Android Marketplace! 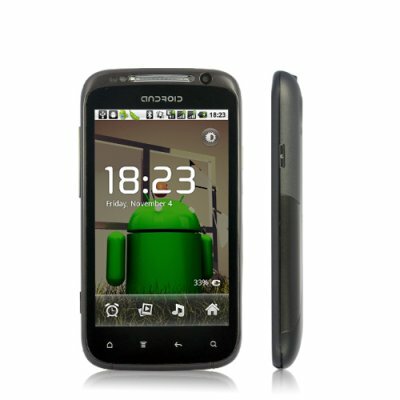 Note: This Android cellphone is designed only to work with the current Android OS installed in it. Any alterations such as upgrades or flashing the cellphone and installing a newer version will void the cellphone's warranty.